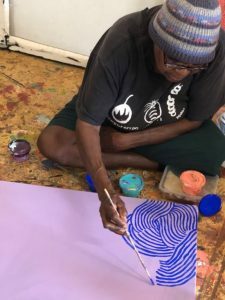 Over the last fortnight, I have had the privilege of being invited to demonstrate methods of canvas preparation for the artists working at Warakurna Artists Art Centre in the Western desert, and also for the Lockhart River Art Centre up in Cape York. The indigenous artists working at these Art Centres are using artists’ acrylic paints. As painting surface, they work with both an artists’ cotton and artists’ linen. During the workshops we briefly touched on the history and characteristics of both of these materials commonly used as painting surfaces. In the 15th century, painters such as Sandro Botticelli, started using linen as material to support their paintings, moving from plaster walls and timber panels to woven linen, especially for large paintings . For instance, the frequently reproduced Birth of Venus by Botticelli, is a famous example of an early canvas painting. By the 17th century, canvas painting had become popular. Dutch, Flemish, French, and German artists in particular, from this period forward, chose linen as their support. A major instigator for this change to linen was the comparative ease of transportation, as well the material’s distinct surface qualities. Another reason for changing to linen, was the material’s ability to create a strong bond between the paint film and the linen fibres. Linen and hemp were the woven fabrics used for painting supports until the late 19th and 20th century. Later, in the 19th and 20th century, cotton became a cheaper alternative for artists – especially for artists that were not as commercially successful as some of their contemporaries. Access to relatively cheap, wide rolls of cotton also contributed to a resurgence of large-scale paintings during the 20th century’s Modernist movement. Linen is woven from a strong, long yarn, which characteristically varies when spun, resulting in slight variations and pronounced threads in the weave of the fabric. Artists often use the texture of the weave to give depth and variation to their paintings. When painting, colour depth, contrast and visual changes can be created by flooding the surface of the linen with diluted paint. Effects can also be produced by letting the paint sink into the weave, and then conversely dragging dryer brushes across its surface. Cotton duck is made from tightly spun and woven cotton threads. Cotton is woven from a much shorter fibre and hence its weave has a more even and tighter texture than linen. Cotton is softer and weaker, especially when the weave is fine and light. Its surface appearance and character are consistent. The fact that cotton is harvested and produced in large volumes, makes it a cheaper alternative compared to other painting supports. Art supply stores sell cotton and linen in its loom state, meaning that it has come straight off the loom. Loom state cotton or linen is also often referred to as ‘raw’ linen or cotton. You can also purchase linen and cotton which has been pre-primed with special sizes (sealers), such as, acrylic gessos and oil primers, especially created for artwork surfaces. In the 1970s, Western Desert Indigenous Australian artists began making their contemporary expressions of ancient tribal ancestral stories, legends and rituals, in acrylic and water dilutable paints. The desert artists quickly moved from board to linen and cotton, similarly to the European painters in the 17th century. Art connoisseurs and art lovers came to appreciate these contemporary paintings from the desert and the diversity of the paintings’ visual effects, especially when they had been created on linen. Collectors also liked the status and providence of paintings on canvas. 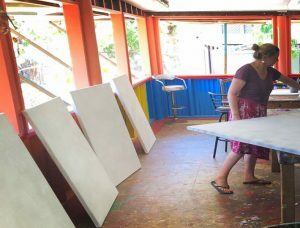 Perhaps the strongest motivation for artists in remote communities to change to canvas as a painting support, might have been the ease of transporting these paintings within their communities and within their country. Often these paintings would be sent on to cities in order to reach a wider audience and a bigger collector’s market. 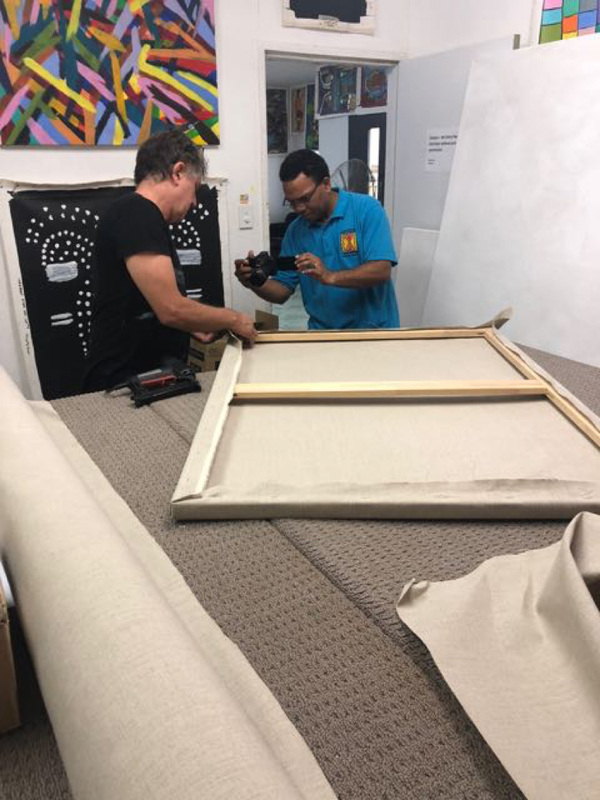 Paintings on linen or cotton of all sizes can be stored and transported safely when rolled onto cardboard or pvc-tube cores and then inserted into hollow tubular sleeves for protection. Transporting rolled canvases is made even more viable by the elasticity of acrylic paint. Acrylic paint is a paint film, that by its construction is quite flexible and robust. Stretching and restretching many times is definitely sustainable with paintings made from artists’ acrylic paints, especially when painted on artists’ linen. As such, cotton, linen and acrylic paint are an optimum material for remote visual art making. 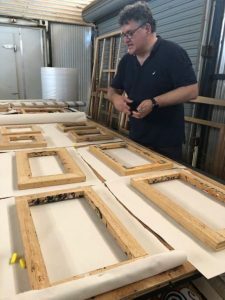 During the recent workshops at both Warakurna and Lockhart River, we focused on using a tried and tested method of stretching and then coating or priming loom state artists’ linen and artists’ cotton duck with acrylic gesso. The linen we chose was #15 looms, which has a mid-range texture and qualifies as being of medium weight. The cotton we worked with was 14 oz. per sq. yard or 475 grms per sq. metre in weight. It is therefore a medium to slightly heavy-weight cotton duck, which has a very even and slightly pronounced weave. It is archivally sound to apply artists’ acrylic resin-bound gesso straight onto the loom state fabric. Its chemical reaction to both the cotton and linen is quite inert. When the primer or gesso is sequentially being painted onto with artists’ acrylics instead of oil-based paints, which tend to be chemically more volatile, it makes the separation of the paint from the fibre not critical. Paintings produced in remote communities are often destined to travel and therefore are often stretched, un-stretched and re-stretched multiple times during their exhibition life. It is thus imperative to work with materials that allow for an especially strong bonding of the paint film to the surface of the cotton or linen. Artists’ acrylic gesso is made from pigments, such as titanium white or carbon black, which are combined with an acrylic polymer as well as with linking resin, small amounts of calcium carbonate and water. The particles of the gesso are water resistant when dry and produce a surface that has a slight tooth. The carbonate in the gesso remains slightly absorbent. All of these qualities produce excellent conditions for bonding subsequent layers of paint to the fibres of the loom state linen or cotton. Applying the acrylic gesso directly to the loom state fabric creates a stronger adherence of the primer to the canvas. This is even stronger when working with linen, as the linen’s complex structure and the long strands of the linen fibres become intermeshed with the gesso. The other great advantage of preparing linen or cotton without first applying a layer of size to the loom state linen or cotton, is the fact that the gesso will have a more matt and slightly absorbent surface when applied directly. As a result, one might see some of the painted marks sink into the surface when applying the first few layers of acrylic colour. Areas painted subsequently over the top of the first paint marks will remain sitting on top. The glossy and slightly synthetic appearance of artists’ acrylic colours produce various effects when applied to the matt, absorbent gesso. As such, working with these materials can create interesting shifts in the painted surfaces and produce intriguing reflections of light in selected areas. Working with artists’ acrylic colours thus offers a rich, interesting and subtle method for achieving varying visual depths. In comparison to paintings that have been painted on machine pre-primed canvases, paintings created on hand-primed surfaces have a very noticeable and distinct richness in colour and surface appearance. By working on hand-primed surfaces, artists can quickly achieve captivating surface effects that are particular to the hand-primed materials used. Hand-primed canvases can be painted while stretched. Alternatively, they may be removed from their stretcher and can easily be taken to wherever the artist may wish to work. When working with loose, hand-primed canvas sheets, the ground or a table top can provide a temporary, rigid support for painting. 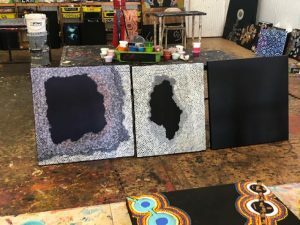 During the Warakurna workshop we coated canvases with white and black gesso and applied another layer of thinned acrylic colour to create coloured backgrounds. Matisse Derivan also makes a range of background colours, designed to have the same bonding properties as gesso. During the workshop we worked with coloured grounds as a means to contrast or compliment the first layer of the paintings. Working with coloured grounds also helps to highlight the negative space in the painting. In Lockhart River we predominantly used white gesso as a first coat, to give under-surface light. We then laid down a second coat of deep matt, black gesso. The matt, black background contrasted and resonated with the natural ochres, which we had hand ground and mixed with binders to make our paint. The Warakurna workshops made clear that it is important to always choose the most appropriate ground or substrate before starting to paint. Furthermore, preparing the surface of an artwork specifically to suit the painting mediums of choice, will ensure good results.